Remember; the old statement – “To err is human”? This statement has its significance in accountancy also. In the case of accounting, human beings often commit mistakes like a – commission, omission and principles. These mistakes occur while maintaining the books of accounting. Some omit to record their entire financial transaction either partially or wholly. Some even make mistakes while calculating, like- adding, subtracting, multiplying and dividing. While calculating in a hurry, some tend to make a mistake while carrying forward the total from one page to another. For example, while carrying forward the sum from a previous page to the next page, one may often miss a number or copy it wrongly. Another common mistake is while posting from subsidiary book to ledger account. It often happens that revenue expenditure is recorded as capital expenditure or a capital expenditure gets wrongly recorded as revenue expenditure. These are the mistakes which are going to be committed to the books of accounting. Mistakes which are made in the accounting books need to be rectified at first. It needs to be kept in mind that errors in accounts cannot be rectified by using a rubber or an ink remover to remove this fault. It cannot be removed even by striking off a mistake or over-writing it or by tearing off a page. Instead, it should be accepted as a fault and a corresponding journal entry for rectification is made. This rectified entry neutralizes the effect of that wrongly passed entry. Further, it even brings the correct effect of a financial transaction. Thus, rectification of errors should be made as early as possible. Thus, it is important that while passing a rectification entry, the nature and types of accounting errors are taken into consideration. These are the mistakes which are made in the treatment of revenue and capital expenditure and receipts. These mistakes remain undetected by the trial balance. Further, these do not even have an effect on a trial balance as both its credit and debit record remains complete. Since this completes the double entry, trial balance tallies. A partial omission of record in the subsidiary books is easily detected by the trial balance as it has an effect on it. A complete omission of record in the original books of accounts is undetected by the trial balance and does not even affect it. Posting incorrect values in ledger accounts. These are detected by trial balance as it has an effect on it. Recording incorrect values in the subsidiary books. These do not have any effect and are not even detected by trial balance. Improper balancing of ledger accounts has an effect on trial balance as it can be detected. Posting at the other side of ledger accounts has an effect on the trial balance as it can easily be detected. Incorrect totaling of subsidiary books like overcasting or under casting affects the trial balance and gets noticed too. 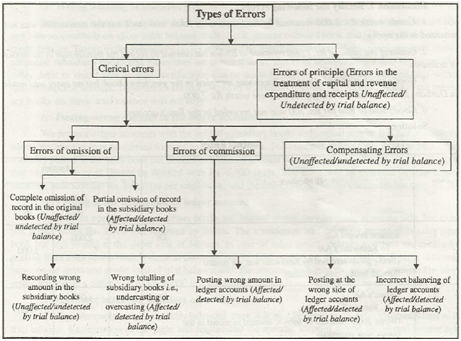 Compensating Errors- These errors do not cause any effect on the trial balance and remain unaffected as the trial balance cannot detect it. This is because it tallies at the end.